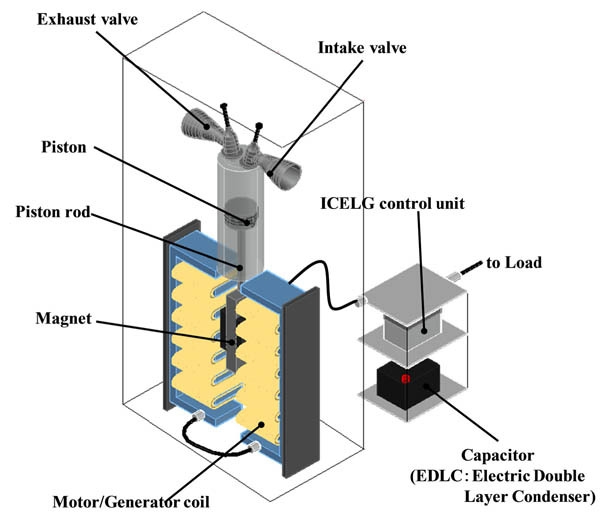 In this paper, a novel generator engine designed to achieve high efficiency, which we call an internal combustion engine with linear generator (ICELG), is proposed and its feasibility and validity are demonstrated using a simulator. Unlike conventional crank-type engines, the ICELG employs a linear motor, which is directly connected to the piston-cylinder unit, instead of a crank mechanism, thus eliminating the motional constraints. This allows the stroke to be changed in mid-operation. The simulator is based on a model of the DC motor and consists of the motor model, which combines the actuator and generator, the engine model, which computes the state changes in the cylinder, and the charge/discharge model, which computes the energy charge and discharge. The ICELG’s feasibility is evaluated by determining the energy losses and charge in the respective models. It is possible to extract a greater amount of energy in the combustion stroke by lengthening the stroke. Losses can be reduced during the intake and exhaust strokes by operating at low speed in order to prevent drastic pressure changes in the cylinder. During the compression stroke, the inertial energy is stored when the pressure in the cylinder is still low, and then subsequently released as inertial force beyond the position from which it can complete the combustion stroke, as a result of which the motor resistance loss is reduced. It was found that the ICELG achieves higher efficiency than conventional generator engines when operated in this manner. D. Arashi, Y. Kakinuma, K. Sugiura, T. Terai, S. Ashizawa, and T. Oomichi, “Research on High Efficiency Operation Method of Linear Generator Engine,” J. Robot. Mechatron., Vol.30, No.1, pp. 93-105, 2018. N. Iwata, T. Sasaki, and M. Ogura, “The EGR Control by the Variable Valve Timing – Cycle Simulation –,” The Japan Society of Mechanical Engineers Kanto Branch 10th Anniversary Block Trans. of Joint Conf. paper, pp. 157-158, 2003. Y. Yoshihara and F. Hosoda, “Development of Variable Valve Actuation Technologies and Trend in the Future,” J. of the Japan Society of Mechanical Engineers, Series B, Vol.112, No.1092, pp. 904-907, 2009. C. Sugimoto and Y. Urata, “Study of a gasoline engine using a flexible electromagnetic valve mechanism,” Mechanical Engineering Congress, 2004 Japan Trans. of Conf. paper, F08-(2), pp. 144-146, 2004. J. Takanashi, M. Takazawa, and Y. Urata, “A Study of high Compression Ratio and High Efficiency Gasoline Engine with VVT Mechanism,” J. of the Japan Society of Mechanical Engineers, Series B, Vol.74, No.746, pp. 2205-2212, 2008. K. Morikawa, M. Kaneko, H. Oiwa, and Y. Moriyoshi, “High Compression Ratio High Efficiency Gasoline Engine with Variable Speed Piston-crank Mechanism,” J. of the Japan Society of Mechanical Engineers, Series B, Vol.73, No.735, pp. 2176-2182, 2007. T, Yamauchi, “Variable inertia flywheel,” Published collection of Toyota Technical, No.163, p. 245, 2004. A. Yokota, “Variable inertia moment flywheel,” Patent 2005-36944 (P2005-36944A), 2005. M. Imai, “Variable weight flywheel,” Patent 7-255732, 1997. H. Ogawa, K. Kimura, K. Sasaki, Y. Sato, and T. Sako, “Performance Improvements in a Spark Ignition Gas Engine with Longer Strokes,” J. of the Japan Society of Mechanical Engineers, Series B, Vol.76, No.765, pp. 852-858, 2010. Y. Shirakawa, A. Shimada, and T. Ishikawa, “Fuel reforming engine system using low concentration hydrous ethanol with improved thermal efficiency and low NOx emissions,” Trans. of the JSME, Vol.82, No.840, 2016 (in Japanese). T. Fukuda, K. Kimura, H. Ogawa, Y. Sato, and T. Sako, “Improvement of Thermal Efficiendy in a Spark Ignition Gas Engine with Longer Strokes,” The Japan Society of Mechanical Engineers, No.10-1, 2010. E. Tomita, “Internal Combustion Engine with Plasma-Assisted Combustion,” The Japan Society of Mechanical Engineers, 2012. K. Hijikata and Y. Mori, “Fundamental Performance of Two-Phase Flow Rotary Expander,” J. of the Japan Society of Mechanical Engineers, Series B, Vol.48, No.425, pp. 160-167, 1982. T. Akazawa, K. Murao, and Y. Okada, “Study of Linear Alternator for Free Piston Stirling Engine,” The Symposium on Stirling Cycle, No.05-39, pp. 33-34, 2005. K. Hoshino, S. Yoshihara, T. Akazawa, and K. Murao, “Performance testing of new type linear alternator,” The Symposium on Stirling Cycle, No.06-29, pp. 109-112, 2006. K. Hoshino and K. Hirata, “Performance prediction of free piston Stirling engine,” The Symposium on Stirling Cycle, No.03-33, pp. 9-12, 2003. Y. Niki, K. Hirata, and M. Kawada, “Development of Stirling Engine Simulator to Simulate Load Charge,” 11th Stirling Cycle Symposium Trans. of Conf. paper, No.08-43, pp. 13-16, 2008. A. Hibi and S. Kumagai, “Hydraulic free piston internal combustion engine,” Trans. of the Japan Society of Mechanical Engineers, Series B, Vol.51, No.467, pp. 2123-2131, 1985. S. Kimijima and N. Kasagi, “Cycle Analysis of Micro Gas Turbine-Molten Carbonate Fuel Hybrid System,” J. of the Japan Society of Mechanical Engineers, Series B, Vol.69, No.680, pp. 1001-1008, 2003. I. Minatsuki and Y. Mizokami, “Design Study on Evaluation for power Conversion System Concepts in High Temperature Gas Cooled Reactor with Gas turbine,” Trans. of the Atomic Society of Japan, Vol.6, No3, pp. 276-288, 2007. H. Ishikawa, Y. Takeda, S. Ashizawa, and T. Oomichi, “Efficiency improvement of the electric generating engine system based on internal combustion engine,” J. of Robotics and Mechatronics, Vol.24, No.3, pp. 487-497. H. Ishikawa, Y. Takeda, T. Ishihara, K. Suzuki, S. Ashizawa, and T. Oomichi, “Development of engine generator system independent crank motion (No.4) – Analyzing piston motion of ICELG for efficiency improvement –,” The 13th SICE System Integration Division Annual Conf., Dec. 19, 2012. M. Sogabe, Y. Iwashita, N. Sonoda, and Y. Kakino, “A Study on the Servo-stability of the Tandem Driven Machine with Linear Motors,” J. of the Japan Society for Precision Engineering, Vol.73, No.5, pp. 605-610, 2007. R. Sato and M. Tsutsumi, “Mathematical Model of Feed Drive System Consisting of AC Servo Motor and Linear Ball Guide,” J. of the Japan Society for Precision Engineering, Vol.71, No.5, pp. 633-638, 2005. M. Iezawa, A. Imagi, and M. Tomisawa, “High-Precision Control of AC Servo Motor Positioning Systems by Friction Compensation,” J. of the Japan Society of Mechanical Engineers, Series C, Vol.59, No.568, pp. 207-212, 1993. T. Shinoda, “Development of a Hard Surfacing Process for the Inner Bores of Aluminum Engines,” J. of Smart Processing for Materials, Environment & Energy, Vol.4, No.3, pp. 130-134, 2015. Y. Wakuri, M. soejima, T. Kitahara, M. Nunotani, and M. Ootsubo, “Studies on the Characteristics of Piston Ring Friction,” J. of the Japan Society of Mechanical Engineers, Series C, Vol.58, No.551, pp. 287-292, 1992. K. Korematsu and M. Hasegawa, “Total-System Simulation Model of Two-Stroke Cycle,Crank Case Compression-Type,Spark Ignition Engines,” J. of the Japan Society of Mechanical Engineers, Series B, Vol.59, No.560, pp. 419-424, 1993. A. Roberts, R. Brooks, and P. Shipway, “Internal combustion engine cold-start efficiency, A review of the problem, causes and potential solutions,” Enegy Conversion and Management, Vol.82, pp. 327-350, 2014. Mitsubishi Heavy Industries, Ltd., “Mitsubishi meiki gasoline engine GB SERIES,” p. 4, 2006. THK, Ltd., “Linear motor series,” p. 331, 2012.